DOSWELL, Va (Oct. 26, 2018) — The children of Penny Chenery – Sarah Tweedy Manning, Kate Chenery Tweedy, Christopher Tweedy and John Tweedy – have announced that their mother’s ashes were interred in Virginia on October 20. A memorial service was held at St. James the Less Episcopal Church in Ashland, followed by a private graveside service at the Chenery family plot in Woodland Cemetery. 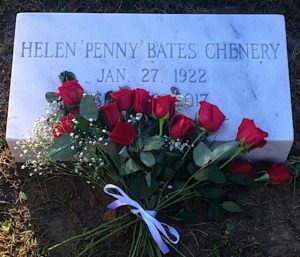 Penny’s ashes were buried next to the graves of her father Christopher T. Chenery and her mother Helen Bates Chenery. Beloved by legions of fans as Secretariat’s owner, Penny passed away on September 16, 2017 at the age of 95, the same date as her father’s birthday. Christopher Chenery founded Meadow Stable in 1936 and established the Thoroughbred bloodlines that would eventually produce the legendary Secretariat. And that’s what her soul needed. She needed horses, not for ambition or sport, but for the connection to the living world of animals that she had grown up with. The spirit of ‘All Things Bright and Beautiful’ that her father had loved. The noble goodness you see looking into the deep of a horse’s eye. Virginia was the family’s real home. It is, of course, where the Chenery family is from for generations back. It’s where Chris Chenery returned once he became rich up north, to restore the Meadow to its former grandeur and raise it to the first rank of the horse world. Kate Tweedy noted that her family has a deep appreciation for their ties to Virginia and what Penny meant to her fans. “We are very committed to keeping Penny’s legacy alive, along with that of Secretariat and his birthplace, The Meadow,” Ms. Tweedy said.